Today’s site of the day is Framestore’s Tale of Despereaux Game, promoting the VFX studio’s first animated feature film, Tale of Devereaux. Visitors to the site take the role of Despereaux Tilling, a mouse with large ears and unusual intelligence. Use the up and down keys to fly or go under the floor, the forward key to break open barrels, urns and cotton reels, the back key to grab money and cheese with your locket. You win points by acquiring cheese (200) and coins (300). Play the game here. Once you’ve been knocked out of the game you’ll be wished a happy and peaceful end to 2008. Framestore is covering the cost of food at Centrepoint‘s Berwick Street Project for the entire month of December. The game, and the movie, are based on the award-winning novel, The Tale of Despereaux: Being the Story of a Mouse, a Princess, Some Soup, and a Spool of Thread, by Kate DiCamillo. 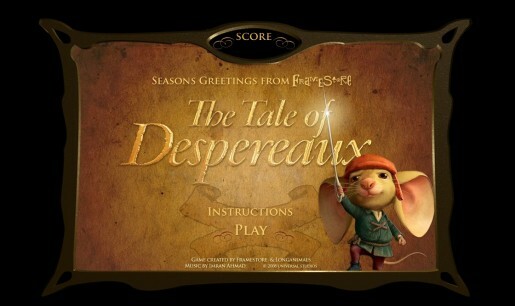 The Despereaux Game was created by Framestore and Longanimals. Music is by Imran Ahmad. The film, in cinemas worldwide on December 19, is presented by Universal Pictures in association with Relativity Media.